On Thursday, September 22, The Iguanas played a fund-raiser for the Greater Baton Rouge Food Bank in Baton Rouge, LA at Dyson House Listening Room. The food bank sustained extensive damage to supplies and equipment during the recent catastrophic flooding in the area. 100% of the proceeds went directly to the food bank, and over $1700 was raised. On Saturday, March 21, The Iguanas performed with a host of Texas Music luminaries in a tribute concert to the late, great Doug Sahm (Sir Douglas Quintet, Texas Tornados) at the Paramount Theatre in Austin. Other performers included Freda and The Firedogs with Marcia Ball, Charlie Sexton, Bill Kirchen, Steve Earle, and others. Also appearing were Sahm's Texas Tornado bandmates Augie Meyers, Ernie Durawa and Speedy Sparks. The tribute coincided with the SXSW Film Festival premier of Joe Nick Patoski's documentary about Sahm titled "Sir Doug And The Genuine Texas Cosmic Groove." Many thanks to our fans for voting JUAREZ "Best Roots Rock Album of 2014" in OffBeat Magazine's "Best of the Beat" readers poll. The Iguanas will be kicking in the New Year slightly incognito as Los Reyes Lagarto with our old friend Ed Volker (Zeke Fishhead), formerly of The Radiators, at the 1st Annual Boudin Ball at Chickie Wah Wah in New Orleans. The fun starts at 10 PM with Leyla McCalla (Carolina Chocolate Drops) followed by Lafayette guitarist Dege Legg. Bring your dancing shoes and be ready to party! 12/27/14: VOTE FOR THE IGUANAS! If you like the latest Iguanas cd JUAREZ, follow this link to cast your vote in OffBeat Magazine's Best of the Beat Awards for BEST ROOTS ROCK ALBUM OF 2014. The Iguanas are also nominated for BEST ROOTS ROCK BAND. It's a good opportunity to show your love for the band as well as all your other favorite Crescent City artists. Voting ends January 8. 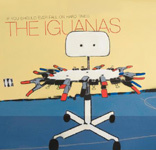 The brand new full-length album by the Iguanas titled JUAREZ was released on March 11 and is available on iTunes, Amazon.com, and by mail-order from Louisiana Music Factory. Purchase our new 45 rpm single from Louisiana Music Factory for only $5.99 + shipping and handling. Side A - "Love, Sucker" b/w "Soul Kiss." It"s finally here! Starting today, you can pick up your copy of our new CD Sin To Sin, or download it from iTunes or Amazon.com. Follow the link below (or paste in your browser) to order direct from Louisiana Music Factory, the world's leading source of Louisiana/New Orleans music. For two nights in a row this past weekend, we had a surprise visit from Jimmy Buffett and Jazzfest co-founder Quint Davis at shows in New Orleans . Buffett was in town headlining a concert for the NCAA Basketball Final Four Weekend, along with Kiss and The Black Keys. We didn't get a chance to ask him, though, about his wearing of a "Free Sean Payton" t-shirt onstage at his concert... Buffett grabbed a guitar and joined us onstage at d.b.a. on Frenchmen St. Friday night, and checked out the first set of the semi-regular, always rocking Hermes Bar gig in the French Quarter following his big show on Saturday. On Saturday, April 28, on the first weekend of the 2012 New Orleans Jazz and Heritage Festival, The Iguanas will join our friends Los Lobos for a rocking show at Republic New Orleans, a music venue located at 828 S. Peters St. in the warehouse district.You don't want to miss this one! Enjoy an hour of music recorded recently at one of our favorite venues, Rock 'n Bowl in New Orleans on this nationally syndicated radio program hosted by WWOZ's George Ingmire. We're very excited to be working with Mark Bingham at Piety Street Studios on our new album, which we hope will be released in early 2012. Piety is one of the finest studios in New Orleans, and has been home to a wide array of recording artists including Allen Toussaint, Elvis Costello,The Dirty Dozen Brass Band, Dr. John, Marriane Faithful, and Dave Matthews Band to name but a few. Spoiler alert: This story contains speculative information that suggests possible future plot points in HBO's 'Treme.' Proceed at your own risk. The Iguanas want to do everything we can to keep our fans updated on current happenings in the music world. That's why we've created our own Twitter account, so we can keep you up to speed about upcoming gigs, broadcasts, and news items. Visit us on Twitter and sign up to follow The Iguanas! On Sunday, November 6, The Iguanas will perform at the St. Bernard Coastal Restoration Benefit Concert to be held at the Sigur Center Civic Auditorium in Chalmette, LA. Still recovering from Hurricane Katrina, St. Bernard Parish now suffers from the effects of the Deepwater Horizon Oil Spill disaster. The most direct impact has been to the fishing industry. Over 300 miles of coastline and marsh were impacted by oil in St. Bernard Parish alone. Proceeds from the concert, hosted by the St. Bernrard Parish Government, will support restoration of the coast, marshland and fishing community which were all impacted by the Deepwater Horizon Oil Spill disaster. Prior to the event, concert-goers and residents alike are welcome to purchase local seafood dishes which will be served in front of the auditorium from 3:00pm to 5:00pm. Doors for the concert will open at 4:30pm. Tickets range from $50-125 and can be purchased by visiting the Frederic Sigur Civic Center Auditorium website at http://www.sigurcenter.com. The Iguanas' upcoming tour begins in Sellersville, PA at the Sellersville Theater on Thursday, 7/22, then it's on to the Pittsburgh Blues Festival (7/23), Sullivan Hall in NYC (7/24), Venue Music Bar in Portland, ME (7/25), and Café Nine in New Haven (7/27). Check out Sullivan Hall's Facebook Page and go to "events" to see photos of the Iguanas and check out info about the show. Be sure to RSVP! In a recent article in the New Orleans Times-Picayune, Eric Overmyer talks about how he and David Simon, co-creator of the HBO series Tremé, came to be interested in featuring New Orleans musicians in a television series after including the Iguanas tune "Boom Boom Boom" in a scene on the hit show Homicide: Life On The Street in 1997. Check out the story and scroll down to watch a video of the 2 1/2 minute sequence which features the song. A big thanks to New Orleans' own OffBeat Magazine and everyone who voted for The Iguanas in the 2009 Best Of The Beat Awards. For the second straight year, The Iguanas won the award for Best Country/Folk/Roots Rock Performer. Last year, the band won in the same category, as well as Best Roots Rock Album. Other 2009 recipients include Deacon John - Lifetime Achievement in Music, Allen Toussaint - Artist Of The Year, and Quint Davis - Lifetime Achievement in Music Business. The Iguanas will be playing a show co-billed with Anders Osborne this Sat. night, 12/12, at Tipitina's, 501 Napoleon Ave. in New Orleans. 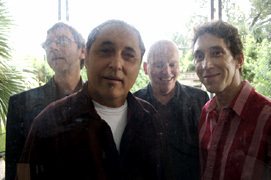 Tune in to tipitnas.com for a live webcast starting with The Iguanas' set at 10 PM. Acclaimed documentary filmmaker Robert Mugge ("Sun Ra: A Joyful Noise," "Sonny Rollins: Saxophone Colossus," "New Orleans Music In Exile") has a released an online version of the 1996 documentary short "Iguanas In The House." Watch the 27 minute film about the making of the CD "Superball" in flash video streaming live from his site in its entirety. The film also features guest percussionist Armando Montiel and the late Keith Keller, co-producer. The new CD Man of Somebody's Dreams is now available on Yep Roc Records. This musical tribute to the late Chris Gaffney features performances by The Iguanas, Los Lobos, Dave Alvin, Joe Ely, the late Freddy Fender, and many others. A founding member of the Hacienda Brothers and a renowned west coast country-soul singer/songwriter, Chris Gaffney moved people as much with his smile as with his trademark croon. Gaffney passed away in 2008 after a courageous battle with liver cancer, and is survived by his family and the litany of musical heroes he called friends and collaborators. WWOZ 90.7 FM in New Orleans will broadcast The Iguanas' show at the South by Southwest Music Conference live over the radio and streaming world-wide from their web site on Thursday, March 19. You will be able to listen to sets by Yep Roc Records label-mates Beausoleil (10 pm) and The Iguanas (11 pm) by pointing your browser to wwoz.org. The showcase of five Yep Roc bands (which also includes Howe Gelb, The Gourds and Dave Alvin's tribute to Chris Gaffney) takes place at the famed Continental Club in Austin, TX. It's been a number of years since The Iguanas held down a weekly Sunday night spot at the historic Maple Leaf Bar on Oak Street in New Orleans. Make plans to come out and party with us for a special Friday night gig at the famed bar in Riverbend! Offbeat Magazine, New Orleans' monthly music publication, has honored us with not one, but two "Best of the Beat" music awards. At a special gala at Harrahs Theater in New Orleans, The Iguanas were presented with awards for Best Roots Rock Band [other nominees were: The subdudes, Susan Cowsill, Paul Sanchez and The Zydepunks] and Best Roots Rock Album of 2008. Thank you, Offbeat. John Swenson, consulting editor for New Orleans' music monthly OffBeat Magazine has written a thoughtful and detailed article about the making of ...Hard Times. After what seemed like a very long wait, the new Iguanas album is finally a reality. Just released today on Yep Roc Records, this is the first Iguanas release in five years. The Iguanas recently recorded a track for a CD tribute to our friend and brother Chris Gaffney, who passed away in April. The CD, a compilation of Chris Gaffney songs, is being put together by Dave Alvin (who performs a track on the album as well), and will also feature Los Lobos, John Doe, Joe Ely, Alejandro Escovedo and the late Freddie Fender. The Iguanas track was recorded at famed Studio In The Country in rural Bogalusa, Louisiana. Look for the tribute album soon on Yep Roc Records and enjoy songs by this tremendous songwriter who will be greatly missed by us all. Now available for CD or download purchase: The Iguanas' set from the Gentilly Stage of the 2008 New Orleans Jazz and Heritage Festival. This recording features guest artists Eric Lucero on Trumpet, Jason Mingledorf on baritone sax, Anthony Cuccia on percussion and Brian Coogan on keyboards. The performance includes five tunes from the soon-to-be-released album If You Should Ever Fall On Hard Times. CLICK HERE to go to the Jazzfest Live site, where you can listen to previews of the songs, as well as peruse music by other artists from the fest. Our good friend and inspiration Chris Gaffney passed away on April 17 after his brief illness. He will be greatly missed. Celebrations of his life are planned, the first one being at The Cellar in Long Beach, CA on April 30. Go to www.helpgaff.com for more information or to make a donation to his family to help ease the burden of Chris's medical bills. On May 25, The Iguanas performed with special guest Rosie Flores at a tribute concert at The Oaks in Manor, TX, just outside of Austin, to raise money for the family. Also performing were Billy Bacon, Ted Roddy, and Dallas Wayne among others.. The former iguanas myspace page, which was created without our permission, has been removed after protests from The Iguanas that someone was selling our music illegally through a Snocap online store embedded in that page. Our new Iguanas myspace page is totally administered by us, so you can get the latest info such as tour dates and become a myspace friend of the Iguanas. Leave a comment, if you like. If you signed up as a friend of the Iguanas prior to March, please visit the new page and sign up again. The iguanas have just completed rhythm tracks for our new CD, which is due to be released in the Spring of 2008. The songs were all written by The Iguanas and produced by Justin Niebank (Nuevo Boogaloo, Plastic Silver 9 Volt Heart) and were recorded at famed Blackbird Studio in Nashville on the same mixing board that Donald Fagen used to record The Nightfly. We will be spending much of the next couple of months adding parts and putting on the finishing touches, and plan to have the album mastered and released in time for Jazzfest on the Yep Roc label. The popular Iguanas albums "The Iguanas" from 1993 and "Nuevo Boogaloo" from 1994 are finally available to the public after years of being out of print. We are happy to announce that digitally downloadable copies of both albums are now available online for $9.99 each at Apple's iTunes Music Store. You can also purchase individual songs for $0.99 each. The highlight of the summer so far has to be last months workshop at the Winnipeg Folk Festival, when The Iguanas shared the stage for a long set with our friends and one of our favorite bands, Los Lobos. It was interesting to hear their take on our tunes, and it was a treat for us to play with them on some of our favorite Los Lobos tunes. David Hidalgo and Steve Berlin (pictured at right with Iguanas Joe Cabral and Eric Lucero) also joined us late that night for our set at the wrap party for festival volunteers. Founded in 1974, The four-day-long Winnipeg Folk Festival attracts an audience of about 60,000 people.